Paris, France and Cambridge, United States, 14 November 2018 – Servier, an independent international pharmaceutical laboratory, and LabCentral, a well-known launchpad for innovative life sciences startups in the United States, have announced the Golden Ticket 2018, sponsored by Servier, has been awarded to Amathus Therapeutics, a startup engaged in the development of novel therapeutics for neurodegenerative diseases, such as Parkinson’s, and rare lysosomal storage disorders. 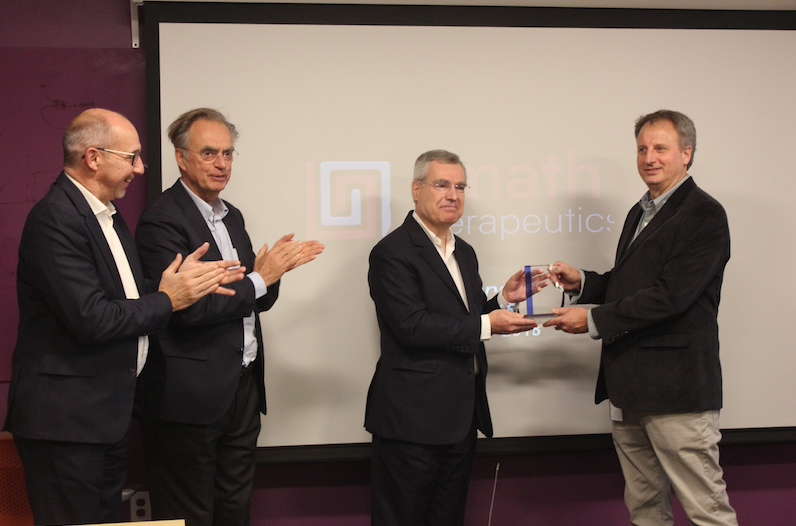 The prize was presented by Olivier Laureau, president of Servier, during the ceremony held last week on the premises of LabCentral, Cambridge. Awarded by Servier since 2017, as part of its sponsorship program with the prestigious American co-working establishment, LabCentral, this prize aims to support for a period of one year, a startup research program corresponding to one of the Group’s therapeutic areas. The Golden Ticket award, worth $50,000, underwrites the cost of a lab bench for a scientist to reside in LabCentral’s open lab for one year. During this period, the scientist benefits from all the latest research equipment, shared infrastructure, as well as numerous programs and services offered by the startup launchpad. The company will also benefit from LabCentral’s corporate development support (e.g., co-working area, business coaching, investor relations). Amathus Therapeutics is developing first-in-class, small-molecule therapeutics designed to enhance mitochondrial function, which have the potential to treat neurodegenerative diseases, such as Parkinson’s disease, and lysosomal-storage disorders — rare, but devastating inherited metabolic diseases that are characterized by an abnormal build-up of various toxic materials in the body’s cells as a result of enzyme deficiencies. “We are honored to receive this award from Servier — a company with a long and distinguished history of innovation and commitment to patients — and are excited about this wonderful opportunity to build a relationship with the Servier team,” said Edward Holson, Ph.D., chief scientific officer of Amathus Therapeutics. He continued, “Having regular interactions with potential partners and funders, like Servier, and three-floors-full of early-stage science companies filled with truly brilliant people, is a primary benefit of being a startup at LabCentral”. The cooperation agreement with LabCentral is part of Servier’s dynamic collaborative partnership strategy, which aims to better respond to the challenges of therapeutic innovation by placing its research activities in the most dynamic research ecosystems where creativity, innovation and entrepreneurship are promoted and valued. This new collaboration also confirms Servier’s commitment to developing its partnership strategy in the United States, where the Group has been implanted since 2018 via the two entities: Servier BioInnovation and Servier Pharmaceuticals, its new commercial subsidiary. In 2017, the Golden Ticket was awarded to Revitope, a start-up specializing in biotechnologies, whose innovative technology aims to allow antibodies to precisely target cells to be treated in patients with cancer and inflammatory diseases. Thanks to the support from Servier and the accompaniment by LabCentral, the startup was able to carry out determinant studies in validation of their technology. The Servier teams remain in contact with the startup and closely monitor the evolution of their work in order to potentially benefit certain Group research programs. LabCentral is a first-of-its-kind shared laboratory workspace in the heart of the Kendall Square, Cambridge, biotech innovation hub, designed as a launchpad for high-potential life-sciences and biotech startups. It offers everything young companies need to begin lab operations immediately upon move-in and propel their science forward faster and more cost-efficiently. This includes: beautifully designed, fully permitted lab and office space, first-class facility and administrative support, skilled laboratory personnel, peer learning and networking opportunities, an expert speaker series — as well as critical access to potential funders and industry partners. A private, nonprofit institution, its first site opened in 2013, with support from real-estate partner, MIT. Founding sponsors include Johnson & Johnson Innovation, the Massachusetts Life Sciences Center, Roche, and Triumvirate Environmental. To accommodate demand for growing startups, LabCentral 610 opened in late 2017, with support from Pfizer. LabCentral now has capacity to serve a total of ~450 scientists and entrepreneurs in about 70 companies across its two-building campus. In 2017, it also added the LabCentral Learning Lab for STEM programming to help inspire the next generation of science entrepreneurs.